I have to admit to you it has been a long time since I have made a quick bread. I kind of stopped, because no matter what I was doing my bread would just not come out suburb. It always seemed over cooked and dry. My US Team Manager in the office, out of all people, told me, “Jen, use the convection oven setting and lower the temperature.” Now if you knew this man, he has no clue when it comes to cooking or baking, or does he and he doesn’t share with us?? Well I took his advice and today I made the most, moist delicious bread in a very long time. I am so pleased with it I could just scream. 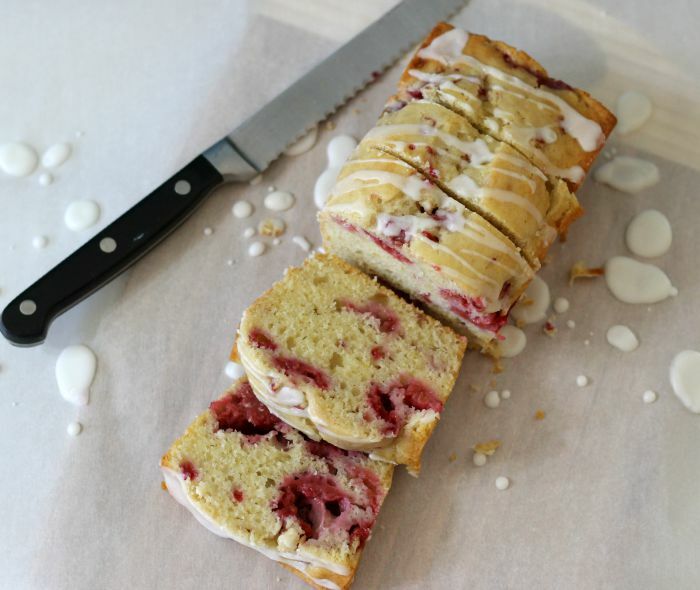 So today I am sharing with you a Raspberry Lemon Bread with a sweet lemon glaze. 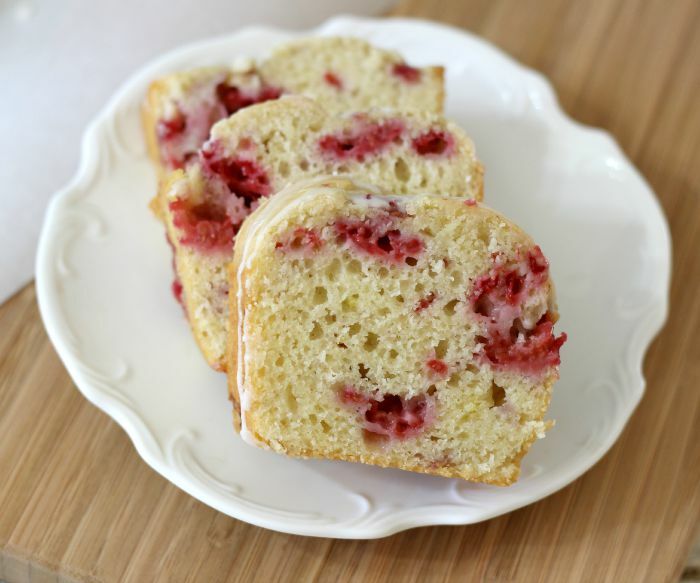 Like I was saying this bread is so moist, light, fluffy, with plump fresh raspberries and a sweet lemon flavor. Of course you can’t forget the sweet lemon glaze over the top. This bread is to die for. You don’t even know how happy I am with it. I lighten up the bread too, by only adding 3/4 cups of sugar and adding greek yogurt for a protein kick and added moisture. 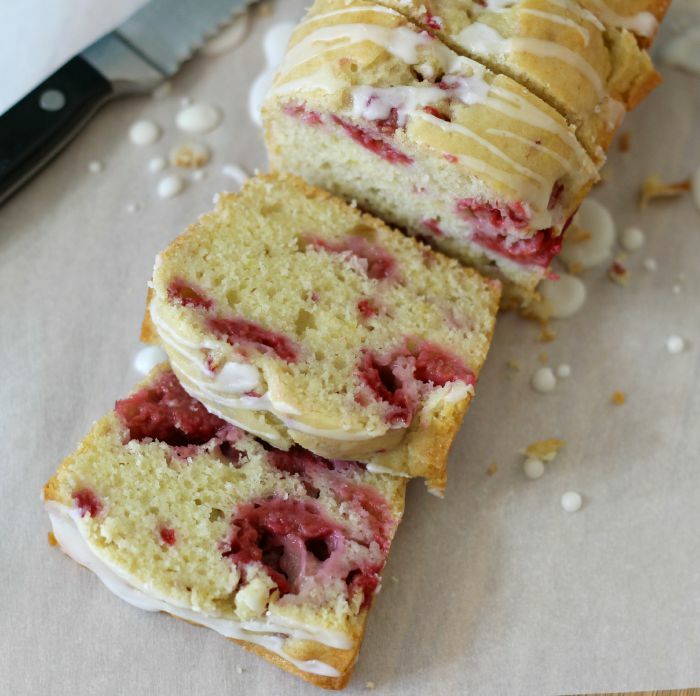 Plus the bread is made with freshly squeezed lemon and fresh raspberries. This bread is a great kick to end the summer season before we start baking with fall foods, like apples. 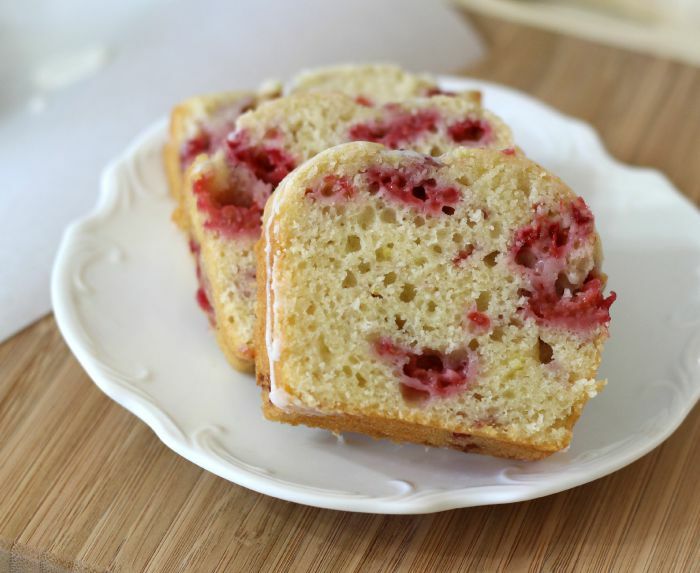 A light, moist fluffy lemon flavored bread that is chock full of raspberries and topped with a lemon glaze. In a bowl, add flour, sugar, baking powder, baking soda, salt and lemon zest; mix until combined. In a large bowl, add eggs, vanilla extract, yogurt, canola oil, milk, lemon juice and lemon zest; mix until well combined. Slowly mix in flour mixture, just until combined. Stir in raspberries. Pour mixture into prepared baking pan or pans (if using mini-loaf pans, fill ¾ way in each pan). Bake for 50 - 60 minutes for single loaf pan or 30-35 minutes for mini loaf pans, until center of bread comes out clean with a toothpick. Cool for about 10 minutes. Take bread out of pan and place on cooling rack to cool completely. Once bread is cooled. In a bowl, add powdered sugar and lemon juice. Whisk together until smooth. Drizzle over the top of the bread. I did not use all of the glaze on my loafs. I also made 3 mini loaves. Oh we, I love my bread. Such a different change adding raspberries. 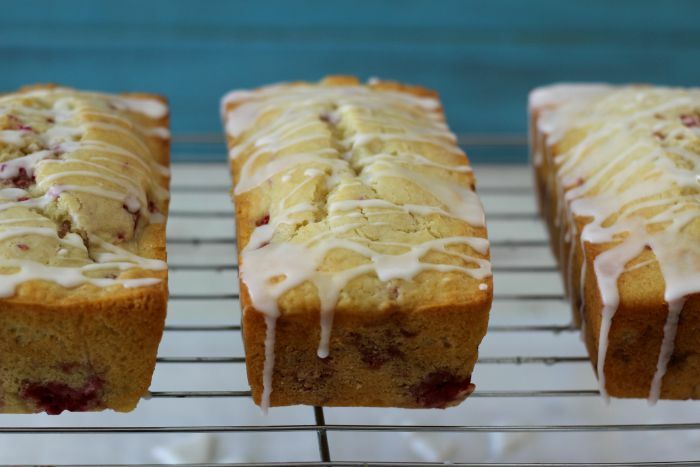 I do want you to know that in my recipe I made 3 mini loaf size pans. One to eat now, one for my Husband and one for me to take to work. I like baking in mini pans, rather than a single loaf pan. I found that I can get 15 slices out of the mini loaf pans, rather than the traditional 12 in a standard pan. Plus it is more to share. I bought my mini loaf pans at Cost Plus World Market. They are pretty inexpensive. I just made this. I followed the recipe but it seems like there was too much liquid ingredient. The bread did not cook fully. I even left it in to cook for much longer then called for. I’m thinking maybe omit the milk or the lemon juice? I set the temperature to 325, and baked for 30 minutes for small loaf pans. My oven cooks quicker then most ovens, so I always have to cut my cooking time. I need to get a thermometer for inside my oven. Hope this helps. What size are the mini loaf pans that you used? Thank you!! Hi Whitney! I think they are 4×5, they are pretty small. About 4″ deep. Just made 3 mini loaves. Delicious, I used sour cream instead of yogurt as I had in fridge left from making cookies. Very quick and easy, thanks for the recipe! Hi Sue, You are very welcome. Love that you added sour cream. Enjoy!